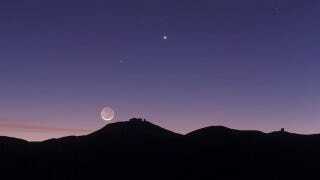 Scientists looking at Earthshine reflected from the moon have concluded that, indeed, there is life on our planet. Though the result may be obvious, the findings can help in the search for life on other worlds. This is not the first time that researchers have tried to see what the Earth would look like when viewed remotely. For example, the Voyager 1 spacecraft's famous Pale Blue Dot image shows the Earth from nearly 4 billion miles away, giving a rough idea of what extraterrestrial telescopes looking at our planet would observe. The recent study tried to get an outsider perspective from slightly closer to home. The sun's rays hit the surface of the Earth and are reflected through the atmosphere. Most of that light escapes into the blackness of space but some of it bounces off the moon. "Essentially, we use the moon as a giant mirror to look back at the Earth," said astronomer Michael Sterzik of the European Southern Observatory in Chile, who co-authored the new paper out in Nature on Feb. 29. This light contains a great deal of information. Break the light from a distant star into a spectrum and you can determine what elements are present. One day, when scientists can directly detect light from an Earth-like planet, they may be able to check if its atmosphere contains things like oxygen, nitrogen, and methane. If present, these gases may represent biosignatures for distant life. In addition to checking the Earthshine's color, Sterzik and his team looked at the polarization, or direction, of the light waves bouncing off the moon. They were able to match the polarized light to different models, where our planet's surface contained potential percentages of things like oceans, continents, and vegetation. The model that best fit the polarized light contained a combination of these elements that looked exactly like, well, Earth. Though it may seem trivial at first glance, the finding has profound implications in the search for extraterrestrial life, said astronomer Darren Williams at Penn State Erie, The Behrend College, who was not involved with the study. "It's a demonstration that we have a fighting chance of learning what the surface of a distant planet is like," he said. While information about Earth's biomes is useful, distant life could potentially be very exotic. Does it make sense to assume that life on other worlds will be very much like our own? "Earth is the only example we have of a life-bearing planet," said Sterzik. "If it is typically characteristic, we don't know. But it's not absurd to assume that life evolved along the same principles elsewhere."